With 45 years of experience, DUX manufactures four-wheel drive articulated underground mobile equipment designed to meet the needs of hard-rock mining and tunneling projects worldwide. DUX offers a full range of equipment for underground haulage, concrete transport and shotcreting, utility applications and scaling. All DUX products come with on-site commissioning by factory technicians and intensive training, as well as fast parts service and technical back-up through a worldwide network of distributors. Ranging in capacity from seven metric tonnes (Mt) to 50Mt, DUX four-wheel drive articulated underground mine trucks are available with custom dump, teledump or ejector box manufactured to suit the weight of material to be transported. These units feature high power-to-weight ratios for fast tramming up steep ramps and offer outstanding reliability. DUX four-wheel drive articulated underground concrete haulers, remixers and shotcreters are designed and manufactured for concrete / shotcrete transport and ground support applications. Available in cassette configuration, DUX utility vehicles perform a wide variety of tasks from materials, water, fuel / lube and personnel transport to roof access, AN/FO loading and lifting. These machines are extremely rugged and have a service life measurable in decades. Proven in the field for more than 15 years, DUX underground scalers are cost-efficient, reliable, high-production machines designed to safely scale loose rock from up to 9.14m (30ft) high tunnel backs and ribs. DUX model DT-20T Concrete Haulers worked round the clock on the Channel Tunnel Rail Link Project, delivering concrete to a Gomaco Commander III Slip Form Concrete paver from a Davidson's Compactor Batch Plant. 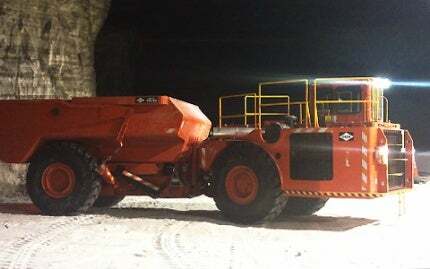 The 1.83m (6ft) wide DUX DT-12 articulated four-wheel drive underground dump truck is easy to manoeuvre in confined areas and very well-suited for narrow vein mining.